Inequality in Israel is among the highest in the OECD (this refers to net income inequality, that is, inequality of income after tax and transfers). 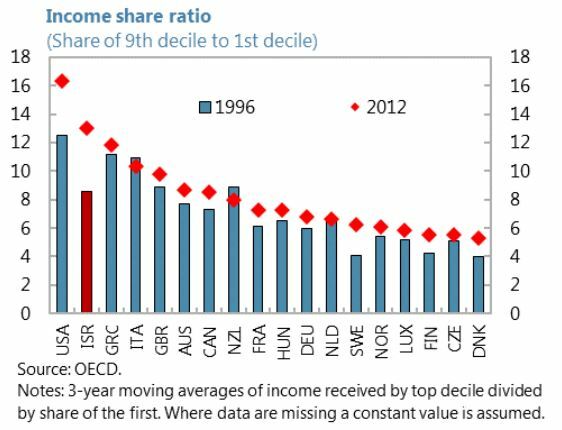 The income share of the richest 10 percent of people is 13 times the share of the bottom 10 percent, a ratio that is exceeded only by the United States. 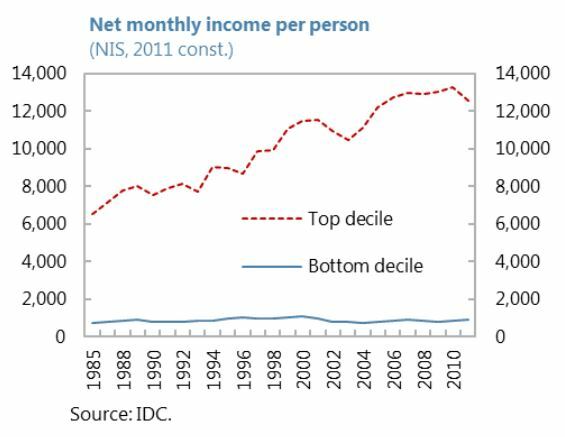 Real disposable incomes of the top decile have increased since the 1980s, while incomes of the bottom decile have stagnated. Israel’s Gini coefficient of disposable income is among the highest in the OECD. Average incomes in Israel are similar to those in Korea and New Zealand but well below the level in richer Western European countries and the United States. There was rapid catch-up toward U.S. incomes between 1950 and the mid- 1970s, but since then Israel’s average income has stagnated at around 60 percent of US average incomes. Part of this stagnation is due to low productivity growth. One reason may be that Israel is the most restrictive amongst advanced economies in terms of product market regulations—state control, barriers to entrepreneurship, and barriers to trade and investment all rank amongst the highest across its peers.. In terms of sectors, Israel ranks amongst the highest in regulation of network sectors, retail trade and professional services.